1. Not sincere and honest about one's intentions: The police told the young man to be absolutely truthful and law-abiding and to avoid any devious answers to their questions during the investigation. 2. Referring to something which does not adhere to the proper procedures or standards of behavior: Alice heard that her friend used devious means to get the answers to the test in biology ahead of time. 3. Characteristic of something which is rambling or is roundabout; usually, that which changes directions many times: Because of an accident on the major highway, James had to go home by a devious route. 4. 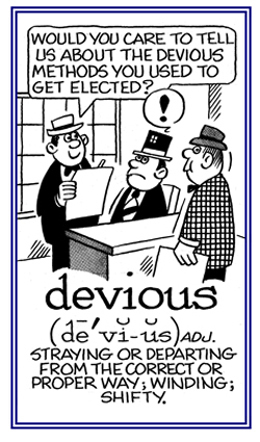 Etymology: from Latin devius, "out of the way"; derived from de, "from" + via, "way". © ALL rights are reserved.